The BBC’s science and environment page today features an interactive graphic on how an offshore wind farm is constructed. It starts with a navigable photo of the Harland and Wolff’s docks in Belfast where the turbines for a new offshore wind farm in the waters off Cumbria, UK are being assembled. Then you can watch videos on the different phases of construction, and finally there are a series of videos at the Ormonde offshore wind farm itself. The feature also highlights the number of workers it took to build the offshore farm including 350 people working over 957,360 hours on the foundations, 50 people working for 75,000 hours on the substation, 60 people working for 111,000 hours on the export and array cables, 40 people working for 78,000 hours on the wind turbine generator installation, and 20 people working for 190,000 hours on project management and support. While the BBC mentions that offshore wind is currently an expensive way of producing electricity, EWEA believes that offshore wind will become much more cost effective and efficient in the years ahead – just like onshore wind has already. In 2010, offshore wind power cost just under €3,000 kW compared to around €1,200 kW for onshore wind energy, but the costs are tumbling fast. 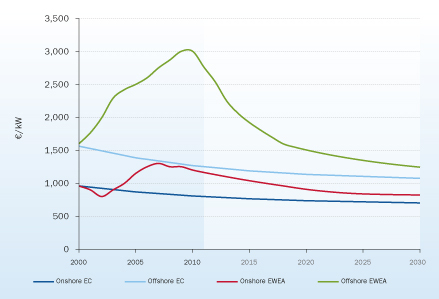 EWEA believes that by 2015 the cost of offshore will have fallen to around €1,800 kW, dropping off to €1,500 kW by 2020 and tailing off again by 2030 when offshore wind power will only be marginally more expensive than onshore wind power. 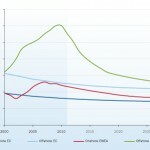 Take a look at the graph below. If you are keen to find out more on our latest cost and other predictions, read our ‘Pure Power’ report online or request your own free hardcopy.